Man, Norway is on fire right now with its debutant authors! It thrills me so much that Norway is producing so many new and great authors! Here comes the book of another Norwegian debutant, and she writes about psychology. You know that will be my cup of tea! Katherine is anxious and doesn’t want to go outside. Nora hates people and prefers to avoid all of them. Emma is depressed and sleeps most of the day away. Three women so unlike each other, yet they all feel trapped. Trapped within their own thoughts. What they don’t know is that someone wants them out of the way. You know how I never solve a mystery when the book I read involves one? WELL! Not anymore, because I actually solved this one! Yes, that was my gloating about my brain and cleverness for the day, haha. Now to the book; Those You Do Not Know is like I said a debutant book, and I have to say that it is very well executed! The language of the book is simple and to the point, but there are some language traps in between the lines. These traps are sometimes just traps, and other times they are good hints to where the story might be heading, and that keeps the reader, or at least me, engaged with the story. The book is parted in seven, and I think I started to suspect where the story was headed around part fourish. I think my degree helped me somewhat though, not gonna lie, but even for one who is educated in psychology, the ending wasn’t obvious! There was always something that didn’t fit my solution to the story, so even though I started to suspect the ending at some point I wasn’t truly sure until the very end due to those language traps that I mentioned earlier. For people who know a bit about psychology, I also experienced that it was several possible solutions to this story, which I found very enjoyable! This is a book for both beginners and educated people within psychology in my opinion. Storywise Those You Do Not Know is well structured. The way the story is parted into characters makes it easy to follow, and the way we are introduced to the characters, Katherine, Nora, and Emma, is quite intriguing. We get enough information to start the puzzle, but not enough to see the connections right away. This, of course, makes it more fun! Character-wise I enjoyed Nora the most. Her way of thinking was puzzling at first, but when I got to know her better she was the most interesting character. Why you ask? Hah, I’m not gonna spoil the fun for you. When it comes to describing the setting of the story Tollefsrud doesn’t give too much away. You get a sense of them through the girl’s descriptions, but your imagination is also allowed to make its own adjustments which, in my opinion, suits the whole storyline quite well. Unfortunately for my foreign readers, this book has yet to be translated, but someone should get straight on that case! 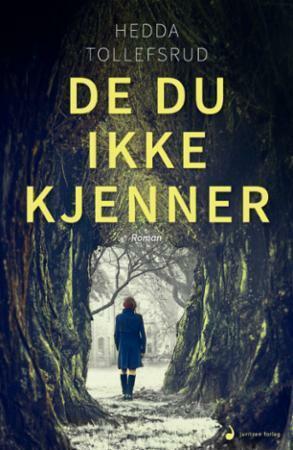 If you are Norwegian and you like crime books with a psychological twist, then I really think that you should check out Those You Do Not Know. I had such a great time while reading it, and you’ll get sucked into the story before you know it. The pages just flew by! If you haven’t read books of this kind before I also believe that it is a good book to start with, simply because it is so well executed and have a simple language. Thank you, Juritzen Forlag for sending me the copy of the book, it was a pleasure to read it!